A shrub for all seasons. A native of the Pacific Northwest. A plant with an edible berry. A landscape addition with leaves of green all year long. This is Vaccinium ovatum or the evergreen huckleberry. 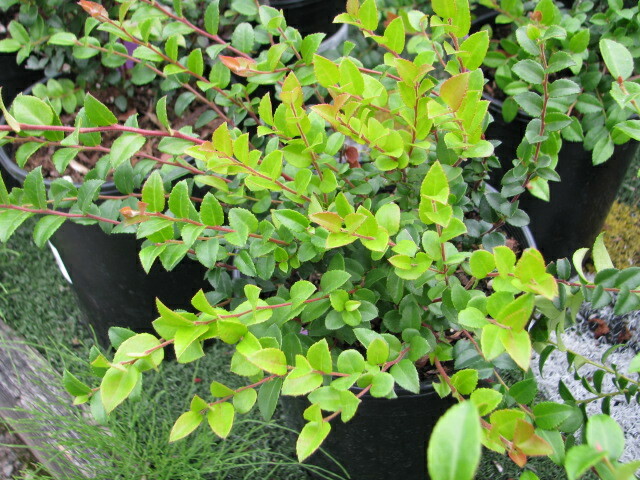 Included in this beloved group Vaccinium is the blueberry, red huckleberry and cranberry. This shrub will enhance any garden. It can reach 2-3 feet in sun and 8-10 feet in shade. The glossy green leaves emerge in spring with a bronzy glow, turn a deep shiny green in summer and take on a reddish cast in winter. White/pink bell shaped flowers bloom in spring followed by little black berries in the summer. These are tasty and sweet, but small. The stems are reddish and, like salal, are used in floral arrangements for their enduring leaves. This plant can be used for restoring native vegetation, or as a beautiful addition to any landscape. It is hardy to zone 7–that’s us!—and is found found along the Pacific Coast from British Columbia to California. Recognizing natives can be useful when you’re out on a summer walk and feel the urge for a snack. Learn the leaf shapes and sizes and all types of fruit will be at your disposal: huckleberry, blackberry, red huckleberry, salal berry, oregon grape (sour! ), salmonberry, wild strawberry and Indian plum to name a few. Look beyond the boxwood and barberry and take a chance with a native plant…..huckleberry!